The 2015 Rittenhouse WNBA Basketball factory set continues with the company's run of small but comprehensive lineups. Besides the full base set, each comes with three autographs. 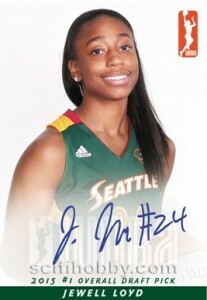 The main 2015 Rittenhouse WNBA set has 100 cards. Each of the league's 12 teams have at least six cards with top players and rookies getting the majority of the attention. As far as autographs go, signatures from the top three picks in the 2015 are included in every set. Jewell Lloyd (first overall) and Kaleena Mosqueda-Lewis (third overall) of Seattle are joined by Tulsa's Amanda Zahui B. (second overall) on the autograph checklist. Not a lot of 2015 Rittenhouse WNBA Basketball is being produced. The set is limited to 500 copies. 3 cards. All three included in each set. 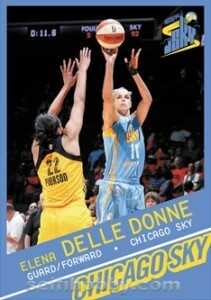 The cards are extremely glossy and will be very difficult to have autographed. Also noticed that they misspelled Courtney Paris’s name on her card.